Sid Padrick, a radio and television technician, 45-year old, father of family, employed in an electronic company in Selva Beach, close to Watsonville on the coast of the Pacific, 120 kilometers in the south of San Francisco, California, the USA, told his adventures on radio and television shows in the United States. On January 30, 1965, or in the night of March 7, 1965, at 02:00 a.m., he claimed, he was waking along Selva Beach, or along the Manresa Beach - the date and the place change with the various versions - and heard a whistling sound to that of a jet plane. Looking up he saw at his "great amazement" a craft, 15 meters in diameter, land before him. He described it as a totally "classic" flying saucer. He wanted to run away but a voice came from the craft, called his name, and told no harm would be done to him. He is naturally invited on board the saucer, and accepted despite his fright. The saucer's door closed on him, and it flew off since Sid Padrick saw that the landscape visible below through portholes became mountainous. A man named Zeeno or Xeno awaited him inside the apparatus, and took him on a visit of the 15 meters diameter saucer that Sid Padrick found fit to describe as having 14 rooms on two floors connected by an elevator, with an "extraordinary quantity of extremely complicated dashboards", a crew of people "like you and me" of seven men and one "very pretty" woman, and an enormous lens through which Sid Padrick soon saw the mother-ship floating in the outer space. In the medias, Sid Padrick would tell that space men are on mission of exploration and survey, that they had been in contact with a group of people in New Zealand for two months, but are not interested in meeting governments. They come "from a planet more distant", or "behind", "another planet that we observe", which, according to Padrick, is in our solar system. The space men communicate between them by telepathy and in perfect English with Sid Padrick, they are 25 to 30 years old, have brown short hair, a very light skin, a face a little more frayed than ours and fingers longer than us. They wear tight-fitted two parts pale blue, almost white, suits, with no apparent buttons or zippers, the shoes are kinds of boots which seem to be part of the suit. The suit's collar has a very nice decoration, finishing out in a V in the front and a kind of galon of colors unknown on the Earth. The rooms in the saucer did not have an angle, all was round, the indirect lighting seemed to emanate from the walls because there were no lamps. The saucer sails in space near a huge cigar-shaped spaceship, then landed on a campsite on Earth in some mountain, where Padrick is invited to get out and walk around the craft to "make sure he was not dreaming." Padrick states that the saucer is not metallic but made of a very hard and polished material, he explains that the only similar material he knows is Plexiglas. The spaceman then showed him a photograph of a town of his home planet, with spaced buildings in the shape of crescent moon, with windows. Roads can be guessed in the distance, and in the foreground there are trees and bushes. Of course, there are no disease, no crime, no vice, no police, no money, no war on the space people planet. There is no school either as "the children learn a profession when they are in their youth." Sid Padrick insists on the religious or spiritual aspect of his trip, as the space man took him along in the "consultations room" of the saucer, some sort of chapel, "inside which the harmony of the colors was so beautiful that I almost fainted." He is asked whether he wishes "to pay his respect to the Supreme Deity?" and Padrick starts to pray, and explain that on Earth this Deity is called God. He would learn that space people do not make a difference between science and religion, that they measure the distances in "lights", that their saucers are propelled by "a beam" coming from a larger ship. Padrick explains that the US Air Force and other ufologists believe that the flying saucers are hostile, but his host ensured him that it is not so and that they only happen to take defensive action when the US Air Force shoots at them. Padrick also claims he was interrogated during three hours by the US Air Force, who had believed his story and who had admitted this then, but he claims he does not insist on that because he is not trying to prove what occurred to him. Lastly, Padrick, who engaged in tours of lectures and interviews to tell this story, explained that the space people will come again to meet him, on a signal they had agreed upon, and that he received a bouquet of flowers with a card that read "from Xeno." statements to the Press, to the USAF, and lectures by the witness. On the beach and insiode saucer. Not reported. Man, father, TV-radio repairman, Air Force reserve. Two piece tight fitting flight suits. Like humans, 8 men, 1 pretty women. Normal but more pointed chin and nose. Normal in boots making one part with flight suit. Normal hair, short for men and long for woman. Invited witness on board saucer, long conversation, trip in saucer. A more recent contactee is a California TV repairman named Sidney Padrick. Padrick, who is 46 years old, was strolling along Manresa Beach, California, at 2 a.m. on the morning of January 30, 1965, when he says he heard a loud humming sound and saw a strange machine land nearby. It was, he said, about 50 feet long and 30 feet high. He has refused to describe it further, claiming that an Air Force major has instructed him not to discuss the details of his experience. In early newspaper accounts of the incident he said that a voice spoke to him from the craft and invited him aboard, assuring him that he would not be harmed. He says he entered through a square door and saw nine normal-looking men inside. One of them spoke to him in English. They all wore bluish-white tight-fitting uniforms and had dark hair. He noted that they seemed to communicate to each other silently, through gestures and facial expressions. Although he insists that he spent two hours aboard the machine, Padrick has not divulged much of what he saw or was told. The author evokes the tall stories of the self-proclaimed "contactees", pointing out the lies of George Adamski, those of a lady claiming to have tea every morning with the occupants of a saucer, and quoting in the same lot that a certain Sid Padrick tells journalists he had a long conversation with an extraterrestrial gentleman named Ziena who spoke excellent English and wore a sober and handsome blue suit. Ziena claimed that on his planet, there was no crime, no vice, no schools: "we live in perfect community with very strict birth control..."
Donald Keyhoe comments that too many of these stupidities, publicized by the Press, would be harmless per se but unfortunately result in the ridiculisation of the subject of the UFOs. The authors indicate that on January 30, 1965, at about 2 a.m., radio and TV technician Sid Padrick was walking along the Pacific coast near Watsonville in California when he heard a sound like a jet roar. When he looked up he saw a shadowy outline of a huge disc-shaped UFO, and started to run away down the beach in panic. He then heard a voice coming from the UFO that assured him the occupants of the object meant no harm to him. They invited him on board and he did that. The crew of the UFO was of 8 men and 1 woman, basically human in appearance though with pointed chins and noses and longer fingers. One occupant told Padrick he could call him "Xeno", the Greek for "stranger" and guided him into the ship; which had two floors with seven rooms each. Xeno was the only one to talk to Padrick, with "no accent whatsoever". He said he was the only one in the crew who spoke English and Padrick is quoted saying that "I believe they can adapt to any conditions they are working under" and that Xeno paused at each question for twenty - five or thirty seconds before he would answer regardless of how minor it was. Perhaps he was getting instructions - mentally - in what response to give. "He told me they were from a planet in back of a planet which we observe - but we do not observe them. He did not say we couldn't observe them. He merely said we didn't observe them. ..."
"The walls, floors, and ceiling were all the same shade of pale bluish - white. There were no square corners anyplace. Everything was rounded, corners, doorways, seats, anything movable or even fixed. Corners of rooms were all rounded. The light seemed to come right through the walls. There was no 'direct lighting whatever. In other words, the whole wall was lit. ..."
"I was shown an oblong lens, which looked like it was part of a lens system. It had a magnified, three - dimensional effect. On it I saw an object which I was told was the 'Navigation Craft' - he never referred to it as a 'Mother Ship.' It looked somewhat cigar - shaped but rounder in the middle - more like a blimp. This was 2:45 or 3:00 A.M., and the object was in sunlight, so it had to be pretty far out - I imagine one thousand miles out; or better. I did not see any markings or portholes on it. ..."
"The spaceman said, 'As you know it, we have no sickness; we have no crime; we have no vice; we have no police force. We have no schools - our young are taught at an early age to do a job, which they do very well. Because of our 'long life expectancy, we have very strict birth control. We have no money. We live as one." "The spaceman took me to a room similar to a chapel but he referred to it only as the 'consultation room.' The color effect in that room was so pretty that I almost fainted when I went in - a mixture of many beautiful colors - I can't describe it. There were eight chairs, a stool, and what appeared to be an altar. He said, 'Would you like to pay your respects to the Supreme Deity?' When he said that, I almost fainted. I didn't even know how to accept it. I said to him, 'We have one, but we call it God. Are we talking about the same thing?' He replied, 'There is only One.' So I knelt on the little stool and did my usual prayer. I'm forty - five years old and until that night I had never felt the presence of the Supreme Being - but I did feel Him that night. It was a very relieved and very exciting feeling, something that would lift you up right out of your steps." "I wouldn't even classify [Xeno] as a scientific person. It's obvious that they are on a very high scientific level, but their relationship with the Supreme Being means a lot more to them than their technical and scientific ability and knowledge. I would say that their religion and their science are all in one." "He told me they do not measure time and distance as we know it, ,but rather in terms of light. When I asked him how fast they traveled through space, he answered that their speed was limited only by the speed at which they could transfer their energy source. He said this craft I was on was not propelled by its own power source, but rather through a power transmitted to them - on a light beam, or on a light source known to them. ..."
"This encounter has meant more to me than just a visit from people from outer space. It means that my life has been lifted way, way up beyond what I could eyer have conceived of before." The authors indicate that investigators discovered that most of those who knew Padrick held him in high regard and believed his story, that two other UFO sightings had been made in the area around the same time, that a crew of Santa Clara County park rangers had seen "a disclike thing" over the Hecker mountains east of Watsonville on December 28, and Monterey Mayor George M. Clemins observed a bright object over Monterey Bay on the evening of January 29. The authors indicate that John Keel wrote extensively about the curious aspect of the contactee phenomenon also in Padrick's case that space people so not measure time and distance as we know it. The authors indicate that the "religious or spiritual aspect," claimed by Padrick is absolutely right as there are subtle hints in his story about that, for example, the UFO has nine occupants, and with Padrick it makes 10, a number they say "is an archetype of unity", "the totality of the universe both physical and material." As every room in the ship is rounded, the authors say it evokes in our minds "images of circles or mandalas, with all that they suggest." The authors say that the seven rooms on each of the two floors inevitably "imply the ancient notion of correspondences, expressed usually, 'As above, so below.'" The authors say that the cigar-shaped "navigation craft" is a masculine symbol and the smaller spaceship we are led to believe was circular may symbolize the feminine. The authors comment on the space people who "live as one", and "There is only One" as related to the notion of "one psyche" in the human people as Carl G. Jung told about. They comment on the space people planet, "in back of a planet which we observe" as an astronomical absurdity but "a pretty clear description of the hidden world of the unconscious, which normally though not necessarily is obscured by the familiar world of the conscious." The author indicates that Sid Padrick is an average American that nothing pushed to an adventure as fantastic as that which he tells to have lived, and who is one of the most famous ufological figure of the United States. He is a radio and television technician, aged 45 years, a peaceful man and father of family of irreproachable reputation, employed in an electronic company in Selva Beach, close to Watsonville, on the Pacific coast, 120 kilometers in the south of San Francisco. "- Don't be afraid, we are not hostile. We mean no harm to you." He is invited on board the craft and agrees in spite of his fright. A door is closed on him, and a man awaits inside the apparatus, whereas the saucer already moved at a fantastic speed since Sid Padrick sees that the landscape visible through portholes became mountainous. The man of the saucer organizes for him a visit of the craft; which has 14 rooms on two floors, connected by an elevator, an extraordinary quantity of extremely complicated dashboards, on which a crew of eight men is busy, and an enormous lens through which Sid Padrick can see the mother-ship in space. Yves Naud then gives the text of an interview Sid Padrick gave to the Little Listening Post magazine published in March-April 1965. "- Why are the space visitors coming here?" "- They are here on mission of exploration and observation. They claim that they want to come back for additional observations. I believe that they observe above all the people. They did not make any allusion to the government, politics or our future. They gave the impression to me that they want make contact with a larger number of people in the future. They claimed to have had contacts with a whole group of people in New Zealand two months ago." "- Where are they coming from?" "- My interlocutor taught me that they came from a planet more distant than another that we see, but that we do not see them. It does not say that we could not see them, but rather than we do not observe them. I think that this planet is in our solar system." "- Who was on board?" "- They are people like you and me. We do have nothing to fear from them. I believe that they were neither angels nor robots. They do nothing here to endanger our lives. After this contact with them, I am absolutely sure. The space beings communicate between them by telepathy." "- What do they look like?" "- All were about 1.75 - 1.78 meters. Weight 68-70 kilogrammes approximately. They had short hair, except the woman. Their hair was capped behind and disappeared in the outfit. We did not enter the room which she occupied, but we passed in front of the open door. I thus saw her only one moment. She was very pretty. I estimate that they were all 20 or 25 years old. They appeared sharp, energetic and intelligent. All had brown and a very clear skin. Their face is similar to ours, but more pointed downwards. Chin and noise pointed. The eyes did not differ ours but the fingers were longer." "- How were they dressed?" "- All were dressed in a two pieces suit tight to the body, of pale blue color, almost white (the same color as the walls). No button or zippers were visible. The shoes, kinds of boots, seemed to be part of the outfit. They had soles and heels. These people moved with gentle steps on a carpet resembling rubber. The collar of the suits had a very pretty decoration. It finished out in a V at the front of and carried a kind of border which colors did not resemble anything I know. They were much more beautiful than our colors." "- Did the man speak good English?" "- He had no accent. It was perfect English. I believe that they can adjust to any condition. He however entrusted to me that he was the only one of the nine occupants who spoke English." "- Was telepathy involved in your contacts on board?" "- After each of my questions, the man observed a 25 to 30 seconds pause. Maybe he was receiving telepathic instructions before answering. I suppose that the crew members communicated by telepathy because I never heard them talk together." "- What were the reactions of the other occupants?" "- They threw a glance at me when I entered their room, but did not leave their work, as if my visit did not bother them." "- The ground, the walls and the ceiling had same appearance (pale white-blue). The rooms had no angles. All was round. The indirect lighting seemed to emanate from the walls. There were no lamps. In other words, all was illuminated." "- Were there instruments panels?" "- Each occupied room included tables of instruments laid out on the walls. In some rooms, there was 4 or 5, in others 15 or 20. But they all resembled each other, although very different from ours. They seemed removable, but I pus to approach me. In the first room we entered, I wanted to approach a wall but my host made a gesture prohibiting it to me. He did not say why and I did not ask. I saw reference marks on the instruments, something which reminded me of the band of the teleprinters, with points and features moving from left to right. There was no screen such as those of our oscilloscopes. On the other hand, there were kinds of pressure gauges without division on the dials. My host told me that the dials were only lighted when in use." "- Was the craft controlled by another ship?" "- I was brought in front of a huge lens which was to be only a part of a system of optical observation. The reproduction of the images had a three-dimensional effect. The one my guide showed to me was the image of what he called the navigation ship (he never pronounced the expression mother-ship). Although it was 02:45 or 3 a.m., the ship was lit by the sun so that it was very far away from the Earth at this time, perhaps at 1500 kilometers or more. I noticed no markings, no porthole on the vessel, whose shaped was like that of a cigar. It was impossible to estimate its dimensions. It was surrounded of a kind of fog or halation in spite of the clear atmosphere. When I left the craft, I managed to see it with the naked eye. I dis no see it anymore after its takeoff. I was told, according to measurements made, that ships are 2 to 2.5 kilometers in length. The man told me then that the craft drew all its energy from the navigation vessel which guided it entirely in space. I thus concluded that the complicated instrument the crew was using was only for observation." "- And the flight in the mountain area?" "- After a pause, the spaceman told me that our craft had moved and was now parked on a large caravans campsite, unused in winter. 'We can't be seen here", he added. I don't have the faintest idea where we were; I thereafter received several information describing the existing campsites in the area. Only one matched the one described by the spaceman. It was 260 kilometers of my home." "- Did you touch the hull of the craft?" "- After having landed in the mountains, the man ordered me to get out so that I realized that I was not dreaming. I thus left the craft alone and walked around it. It appeared to me not metallic but of a very hard material. The only similar product that I know is plexiglass. That of the craft was extremely polished. The spaceman forbid me it to touch it and I felt no particular effect, neither then nor later. I was brought under the craft and looked at the feet on which it rested. I tried to find registration marks or writings, but there was nothing." "- Photographs of their city?" "- The spaceman showed me a pictures and said: 'This is where we live.' This pictured showed buildings in the background, in the shape of a crescent moon. Windows were seen but I can say that I never saw such a strange photograph. The setup of the buildings was nothing like ours. distant from each other, the distance between the next one still greater than with the previous one. One guessed roads in the distance. In the foreground, there were trees and bushes. The photograph was very clear, the smallest details were visible." "- How do they live?" "- The spaceman told me: 'As you know, we do not have diseases, no crimes, no vice, no police force. We do not have schools. The children learn a job in their youth. Because of our long life expectancy, we have a rigorous birth control. We do not have money. We live absolutely united." "- Was your encounter part of a plan?" "- Absolutely. And this plan had a religious or spiritual aspect. The spaceman took me along in the 'consultations rooms', a kind of chapel inside which the harmony of the colors was so beautiful that I almost fainted. Description is impossible. Eight chairs were there, a stool, and what appeared to me to be an altar. 'Do you want to call upon the Supreme Divinity?' he told me. Again, I almost fainted. I did not know what to do. 'We have one of them, I answered him, and we call it God. Do we speak about the same thing?' 'There is only one of them', hr said. I thus knelt on the small stool and I made my usual prayer. I am 45-year old and I never felt the presence of the Supreme Being like that night." "- Did you feel to undergo an electric impulse?" "- Not, it was a very exciting feeling, something which really elevated you." "- Was the spaceman more of a spiritual guide than a man of science?" "- I do not believe to be able to regard him as a man of science, although the scientific level of these people is obvious. But their relations with the Supreme Divinity has a much higher significance than their technical training. You could say that their religion and their science are only one." "- They are measured in terms of 'lights'. When I asked him the speed they traveled in space, he explained to me that this speed was limited only by that to which they could move their energy source. He added that the craft I was in was not propelled by its own energy but by that which was transmitted to it by the beam of a ray of light or a source of light known to them." "- Will they contact the government?" "- Not, not for the time being. According to statements of the spaceman, they do not wish an official contact now. But I thinking more of the military authorities than of the government. I asked him whether they had already tried to contact the military authorities or the government. He answer was no. 'Can I help you in the establishment of this contact?" I continued. Answer: no. And he added: 'Your nation and all the nations want to attack an unknown object without reason, with an aim of destruction.' The words 'without reason' meant that they never came armed on our premises and that there was no reason to attack them and to destroy them. But we know our own attitude: shoot down all that we cannot identify." "- Was some hostility of UFOs noticed?" "- The Air Force and other investigators believe in the existence of hostile craft. The spaceman ensured me that it was not the case and that the craft on board of which I was had ever opened fire at anyone. On the other hand, one had shot at their navigation ship. I asked him whether they had already been engaged in a fight. He answered: 'Yes, but not with an aim of destroying, but of destroying us.' According to this allusion, I have the impression that we are more vulnerable than them. I do not think that the fact that we try to shoot them down causes them the least concern." "- How could we establish a contact with them?" "- We cannot claim to control them, therefore, we cannot create any contact. Only they can do this. At my question whether I could, as a radio amateur, communicate with them, he answered no. Their communication systems are unknown to us, but they listen to us nevertheless. I suppose that they communicate by the channel of luminous or magnetic rays." "- Do you have pictures of hard evidence?" "- I did not have a camera with me. I didn't think of asking the authorization of taking something. It was such a surprise, such a shock, that I though of nothing. "- And your three hours interrogation by the Air Force? "- They asked me a detailed report. I told them exactly what had occurred. They were the first to hear me. They told me not to speak publicly about certain details. As for me, all could be revealed. I do not see why something is with being hidden. I was asked not to say that the extraterrestrial did not have money, to reveal nothing on the kind and dimensions of the craft, because that could have meant, in the eyes of the public, that the Air Force fails their mission. I answered back that there was no reason with all that. "- Did the Air Force reveal information confirming or relating to your experience? "- Yes, at the time. But I won't insist. I do not try either to prove what happened. I do not care to be believed. But I know that the Air Force believes in it. It investigated many times in the area. The investigators came there little after the incident and had the absolute proof that a machine had landed already before the incident and after. "- Are there still other facts that the Air Force wanted to conceal? "- Yes, some: the means of communication and the source of energy. The name of the spaceman, also. They asked me never to repeat this name, because it means nothing. The spaceman had said to me: 'You can call me Xéno.' It was not necessarily a name. I called him Zeno or Zeeno, but it was really Xéno. According to the dictionary, it means "Foreign". "- Will they contact you again? "- Yes, that was agreed. But the next meeting will be of my choice and not theirs. The signal will be given by my execution of a signal we agreed on. They will observe me. "- What is the meaning of this encounter? "- It means to me much more than a simple visit of the extraterrestrials I felt changed, elevated well above all I could have imagined before." Overpopulation was one of the themes in another 1965 story, that of the Californian TV repair man Sid Padrick. Walking along a beach at night he saw an egg-shaped object flying low. He was invited on board where he met a crew of people of both sexes with dark 'short but uncut-looking hair', pointed chins and long thin fingers. One of them, the leader, spoke to him. Bullard's motifs of tour, journey, conference and theophany followed. During the tour, the evasive leader always kept his right side towards Padrick, who noted that all surfaces in the uniformly lit interior were rounded. There was a 'third layer' to which he was not invited, but he was shown a sort of screen or lens in which he saw a cigar-shaped navigation craft. The 'leader' gave his name, but it was nothing more than a buzzing sound, variously transcribed as Zno, Zienna or Zeno. They are insectoid and they 'live as one' in a war- and crime-free, but highly regimented world with strict birth control. Their children are trained for set tasks on 'an unseen world at the back of the one we do see'. They do not measure time and distance as we do. They took Padrick up onto a mountain top where he was allowed to walk alone. The beings said they were on a mission of exploration, but he got the impression there was some unfathomable 'religious' aspect to it, and he had a mystical experience in a sort of chapel. On January 30, 1965: "A Watsonville, California television repairman told today of a two-hour visit, and a brief ride, aboard a spacecraft that came from a world 'a long ways, a terrific distance away.' Sid Roderick, 45, said he was invited aboard with assurances that the nine-man crew was 'absolutely not hostile' and that the craft spent most of the time perched on a hillside not more than 10 minutes' ride from his beachside home. He brought back little in the way of specific information about the other world or the means by which the spaceship operated. 'But I asked if any other person, with more scientific or technical background, could have gained more knowledge,' he reported. 'The answer was: 'absolutely no.' Roderick said his strange adventure occurred about 2 a.m. on January 30, 1965, when he was taking a customary night-time walk on Manresa Beach, about 1,500 feet from the house where his wife and three sons lay sleeping. He heard a 'humming' sound, he related, and then became aware of the ship some distance above him. A voice assured him, before and after it landed, that the craft was friendly. At the invitation of a person whom he assumed to be the commander - a Mr. 'Ziena,' as best he could spell the name he heard only once - he entered from ground level through a large, square door. I wouldn't be sure their world is in the solar system. He said they had been here before, but not how many times, or when their most recent visit was. He did say they would come again. Roderick said the commander told him the visit was for 'exploratory reasons only. But I think it was more than that, truthfully,' he added. 'There was a religious facet which I was unable to decipher.'" 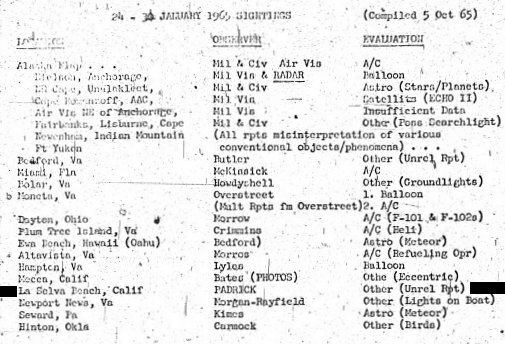 The author indicates that he is convinced that, although ridiculed, some contactee cases are real, objective, experiences, and he then tells of the case of Sid Padrick in California as deserving our attention not least because the witness claims he was asked by the Air Force not to discuss certain details. Tim Good indicates that the witness is Sid Padrick, 44, a TV and radio technician as well as a private pilot with 600 flying hours experience, served in the Air Force during World War II and was serving in the Air Force Reserve at the time of the incident. At 02:00 on January 30, 1965, as he was taking a customary late-night walk near his home, near Watsonville, 75 miles south of San Francisco, at Manreso Beach or La Selva Beach in the US Air Force report, he claimed he saw the shadowy outline of an unlit craft some 75 feet in diameter and 30 feet high shaped "like two real thick saucers inverted". The saucer approached him and came to rest just above the ground. He panicked and began to run, then heard a voice coming from the craft saying "Do not be frightened, we are not hostile." He ran further, the voice repeated the phrase and then added: "We mean you no harm," and invited him on board. When he cautiously approached the craft, a door opened and he went inside, finding himself in a small compartment about 6 by 7 feet. Another door slid open and he entered, to be met by a man, "no different than me in basic appearance, had clean-cut features, and wore a type of flying suit that covered the body fully." "By our own standards I would say they all looked between 20 and 25 years old, very young, pert, energetic and intelligent looking. Their features were similar to ours. There was only one feature I noticed that would differ from us greatly, and that was that their faces came to a point, much more than ours. They had sharp chins and noses. Their skin was somewhat of an 'Armenian' color. Their eyes were all very dark... There was nothing unusual about them - their brightness, depth or luminescence. All the men appeared to have very short auburn hair, but it looked as though it had never been cut - it looked like a natural growth. The lady had long hair and it was pushed down inside her clothing... Their fingers were a little longer than mine. The hands were very clean - the fingernails looked as if somebody had just given them a manicure." "All of them were wearing two-piece suits - slip-on type - light bluish-white in color. They had no buttons or zippers that I could see. The bottom section actually included the shoes - it looked like boots which continued on up to the waistline, without any break around the ankles, just like a child's snow-suit... There was a large band in the middle, and large cuffs, and a large collar that came down with a 'V' neck. The collar had a very pretty design on it... and the neck piece - right around the neck - had a braid of some kind on it. They had soles and heels... I could hear them walking on the rubbery-like floor." The first man acted as spokesman, explaining that he was the only one on board who spoke English. He had no accent whatsoever as he spoke English perfectly. Padrick said he believes they can adapt themselves to whatever condition they are working under. "Every question I asked him, he would pause for about 25 or 30 seconds before he would answer, regardless of how minor it was. Perhaps he was getting instructions mentally - in what response to give. I think if the crew communicated with each other, it was through mental telepathy, because I could see nothing that would indicate communication otherwise." "Each of the rooms that was occupied had instrument panels on the walls, with the crew members concentrating on the instruments. They merely glanced around at me when I entered their room, then turned back to their work, as if they were unconcerned." Some rooms had four or five instruments, others had 10 or 20, of a similar type in each room and "nothing like ours". "I didn't get close to any of the walls that had the movable instruments on them, because when I started to advance in the first room he held out his hand for me not to advance and I didn't, either. He didn't say why and I didn't ask. I saw markings on some of the instruments; something like a tape moving along, with little tiny dots and dashes on it - like our teletype tapes, except they were going from left to right... I wouldn't classify it as a code, like our CW [continuous wave]. There were no screens, such as our oscilloscopes. They had meters, but I could not see dials on them. He said they lit up only when in use." Padrick was shown an oblong lens, which he took to be part of a viewing system with a magnified three-dimensional effect on which he saw an object which he was told was a "navigation craft" that looked like a blimp. "This was 2.45 or 3.00 in the morning, and the object was in sunlight, so it had to be pretty far out - I imagine 1,000 miles out, or better. I didn't see any markings or portholes in it... he told me that the power source (of the craft he was in) was transferred to them from the other craft, and that it did all the navigation and manipulation through space." "He told me they don't measure time and distance as we know it but rather in terms of light. When I asked him how fast the traveled through space, he answered that their speed was limited only by the speed at which they could transfer their energy source." After a while, the spaceman told Padrick that they had traveled some distance and were now parked in a deserted area, which revealed on subsequent investigation to be near Leggett, California, 175 miles northwest of Watsonville. "After we had landed on the hillside, he told me to step out so that I could come back to the place later - to know this was real and not dreamed. I stepped out alone and walked around the outside of the ship. I felt the hull. It seemed very hard but not metallic: I never felt anything like it before. The closest thing to it I ever felt on this Earth would be a windshield - plexiglass. It had a very fine finish, a highly polished finish. He didn't tell me that touching this craft would do me harm, and I had no bad effects from it - none whatever. I was outside for not more than three minutes. I got down and looked at the legs it was on and I tried to find markings on it: I didn't find a mark on it anyplace." "He told me they were from a planet in back of a planet which we observe - but we do not observe them. He did not say we couldn't observe them - he merely said we didn't observe them... I think their planet is in our solar system." "Every building in that picture was rounded off; half moon shaped. I saw windows in the buildings. I cannot say the picture looked like anything I had ever seen before, because the buildings were spaced differently - offset from each other. It looked like they put one about 50 feet from another and the next one 150 feet. There appeared to be roads in the distance and there was foliage in the foreground - trees and bush too." The spaceman told Padrick: "As you know it, we have no sickness, we have no crimes, we have no police force. We have no schools - our young are taught at an early age to do a job, which they do very well. Because of our long life expectancy we have a very strict birth control. We have no money. We live as one." Padrick asked what the purpose of the visit was and the spaceman replied: "Observation only." "I don't think it meant for them to observe us, I think it was for me to observe them... because he did not ask me at any time my name, my age, how many teeth I had, how many members of my family: he didn't ask me one thing about myself, and this leads me to believe that they know about us already, and he came for us to observe them. They did say they would come for further observations... I think they are observing people, mostly. There was no mention of earthquakes, fault-lines, or of anything government-wise, or political-wise, or anything that would affect our future [except that] they gave me the impression that they will pick up more people in future." "When he said that I almost fainted. I didn't even know how to accept it. I said to him, 'We have one, but we call it God. Are we talking about the same thing?' He replied, 'There is only one.'... So I knelt and did my usual prayer... Until that night I had never felt the presence of the Supreme Being - but I did feel Him that night." "It's obvious that they are on a very high scientific level, but their relation with the Supreme Being means a lot more to them than their technical and scientific· ability and knowledge. I would say that their religion and their science are all in one." Padrick was then taken back to where he had been picked up two hours earlier, he stepped out of the craft and walked home. "...they tried to frighten me. They said, 'Mr Padrick, you are a real lucky person... these craft that come down here are real hostile, and you had no business even approaching them. I disagreed with them, because when this craft came down, they did not want to frighten me. . . they did not tell me to go aboard their craft, they invited me aboard." "There were certain details they [the Air Force] asked me not to talk about publicly, but I think in telling it that everything should be disclosed. I can see no reason for anything being held back. They didn't want me to say that the space people had no money. They didn't want me to disclose the type and shape of the craft because that would indicate that the Air Force is not doing its duty. I told them I could see no reason for that, either... They didn't want me to divulge their means of communication and where they got their power from. Also, the man's name - they told me I should never repeat that because it didn't mean anything. The spaceman had said: 'You may call me Xeno.' He didn't say it was his name. Q. How did you evade our radar? A. The hull of our space craft absorbs energy and will not allow a reflection or harmful penetration. A. Yes, we are human, but not your type. Q. How did you pick me for this experience? A. We did not pick you. It was your choice. You are the first person ever to come aboard this ship. We have invited many before but they were frightened away. Q. If I were a scientist could I have learned more? Major Reeder reported that Padrick appears to be of above average intelligence with an excellent vocabulary and command of the English language, a glib talker, and Reeder is quoted saying "It is my opinion that this is not a valid UFO contact but rather an attempt on Mr Padrick's part to get the Air Force involved in order to lend his story some authenticity and credibility." Tim Good explains that he disagrees with this opinion, as although he never met the late Sid Padrick who disappeared from the scene in the late 1960s, having become tired of being harassed, he listened to every inflection of his voice in the recorded interview on which the account is based, and he comes across as truthful. Tim Good says that under a barrage of cross-questioning by civilian investigators at the time, his answers were always clear, precise and without guile, and he was always quick to appreciate the humorous aspects of the incredible situation in which he found himself. The author indicates that on January 30, 1965, near Monterey, California, Sidney Padrick was invited aboard a landed spacecraft by a spaceman who identified himself as "Zeeno" or "Xeno". The authors indicate that on January 30, 1965, in the early morning near Monterey, California, Mr. S. Padrick walked along Manresa Beach and came upon a landed object. A voice invited him inside, and he met a man about 5 feet 10 inches tall with short auburn hair, a pale face, sharp chin and nose, and long fingers, who called himself Zeeno. The authors indicate that the sources are John A. Keel, in "Why UFOs", New York, Manor, 1970, page 212, also published as "UFOs: Operation Trojan Horse", New York: Putnam's Sons, 1970. The ufologist indicates that on January 30, 1965 in the USA, in Watsonville in California, Sid Roderick, 45 years old, met a space crew of nine people and made a tour in a flying saucer. The flying saucer was perched on the side of the hill at less than 10 minutes of Roderick's residence, it was approximately 2 hours of the morning when the event occurred, at the time of one of his usual night walks. He heard a gentle buzzing sound and saw the ship. After the landing, a voice came out of object and ensured of the friendly intentions of the visitors. Then a character called Ziena left by a door on the level of the ground. Roderick was invited inside, which had at least two floors, 14 rooms, and a crew of a perfectly human appearance who wore handsome blue-white suits. Inside the ship the light was also of a bluish white. Ziena spoke English. Between them, the other members communicated by facial expressions and gestures. Roderick received a message of peace of a religious nature. The author indicates that the source is "APRG, on the Internet in May 1997". Sid Padrick was my friend. I met him in 1965 when he came to Seattle to speak at a lecture sponsored by the National Investigations Commission on Aerial Phenomena, headed by Robert J. Gribble. Later it would become the UFO Reporting Center. When Sid came to Seattle he stayed at our house. He drew several pictures for my daughters of the craft he was taken into, where he met the crew of the ship. I also was with him after his lecture traveling in his friend Mike's big white Cadillac. Sid said they are above us and telling me not to talk about them anymore because people here are not ready to understand. We stopped the car and got out and there was the ship above our heads. That was the last time he talked about his contact to the public. The following is what happened to him. Sid loved to go the beach and sleep down there taking his dog along. La Selva beach is located approximately 75 miles south of San Francisco. About 3:00 in the morning on March 7, 1965 he heard a whistling sound. He looked up above him and there was a huge space ship. It was shaped like two rounded soup bowls put together. It scared him so bad that he started running, tearing the ligament in his knee as he tried to climb the bank to get away. A loud voice said "Don't be afraid, we are not hostile. We don't wish you any harm." In spite of his fear his curiosity got the best of him. He approached the ship to a small door in the bottom. It opened and he found himself in a small room where a brilliant white light came on. He figured it was to kill the bacteria or germs on himself. Then another door opened and a "man" was standing there inviting him in. The man was no different than Sid in his appearance, he had clean-cut features, and wore a two piece suit, light bluish-white in color, that covered his body resulting in boots on the bottom half. It had soles and heels. He could hear him walking on the rubbery-like floor. On board were another seven men, similar in appearance, and one woman, described as extremely pretty. They were all about 5 feet 8 inches tall to 5 feet 9. The girl had her long hair pushed down the back of her suit. All the men's hair looked like it grew to a certain length and stopped - it looked like a natural growth. All of them had auburn colored hair. By our own standards I would say they all looked between 20 and 25 years old, very young, pert, energetic and intelligent looking. Their features were similar to ours. There was only one feature he noticed that would differ from us greatly, and that was their faces came to a point, much more than ours. They had sharp chins and noses. Their skin was somewhat of an "Armenian" color. Their eyes were all very dark. Their fingers were a little longer than ours. The hands were very clean - the fingernails looked as if somebody had just given them a manicure. All of them were wearing two-piece suits - slip on type - light bluish-white in color. They had no buttons or zippers that he could see. There was a large band in the middle, and large cuffs, and a large collar that came down with a "V" neck. The collar had a very pretty design on it and the neck piece had a braid of some kind on it. The first man Sid met as he came through the door acted as a guide. He spoke perfect English. When Sid asked what to call him he replied ,"you may call me Xeno". Later we looked up the word in the dictionary. It meant wayfaring stranger. How apropos. Later when Sid lectured here in Seattle he received a huge bouquet of flowers. The card read "from Xeno." As he showed Sid through the craft he always held his arm in front of Sid directing him where he wanted him to go. Sid asked where they came from. Xeno replied from a planet behind a planet that you observe. Sid had a small clipping in his wallet that he showed us. It said that scientists had discovered a planet that is hidden behind the sun. It did not say how far away it was. The clipping verified what he had been told. He did not say we couldn't observe them- he merely said we didn't observe them. Padrick asked the purpose of their visit to our planet. Xeno replied, "observation only." Sid said I don't think it meant for them to observe us, I think it was for me to observe them, because he did not ask me at any time my name, my age, how many teeth I had, how many members of my family; he didn't ask me one thing about myself, and this leads me to believe that they know about us already, and he came for us to observe them. He did say they would come for further observations. I think they are observing people, mostly. There was no mention of earthquakes, fault-lines, or of anything government-wise, or political-wise, or anything that would affect our future (except that) they gave me the impression that they will pick up more people in the future. The floor, walls and ceiling looked much the same, pale blue. The rooms had no corners. Everything was round and indirect lighting seemed to emanate from the walls. There were no lamps, it seemed everything was illuminated. Each of the rooms that was occupied had instrument panels on the walls, with the crew members concentrating on the instruments. They merely glanced around at him when he entered their room, then turned back to their work, as if they were unconcerned. Some rooms had four or five instruments, others had 10 or 20, but they were of a similar type in each room. They were nothing like ours. I didn't get close to any of the walls that had the movable instruments on them, because when I started to advance in the first room he held out his hand for me not to advance and I didn't, either! He didn't say why and I didn't ask. There were no screens, such as our oscilloscopes. They had meters, but I could not see dials on them. He said they lit up only when in use. He was placed in front of an enormous lens which must have constituted only one part of an optical observation system. The image reproduction had a 3D effect. The one my guide showed me was the image of what he called the navigation craft. This was 2:45 or 3:00 in the morning, and the object was in sunlight, so it had to be pretty far out - I imagine 1,000 miles out or better. I didn't see any markings or portholes in it. He told me that the power source (of the craft he was in) was transferred to them from the other craft, and that it did all the navigation and manipulation through space. The huge craft was shaped something like a cigar or a blimp. It was surrounded by a sort of haze or halo in spite of the clarity of the atmosphere. I was told this navigation craft measured over a mile long. Xeno told Sid they don't measure time and distance as we know it but rather in terms of light. When Sid asked him how fast they traveled through space, he answered that their speed was limited only by the speed at which they could transfer their energy source. After a while Xeno told Sid that they had traveled some distance and were now parked in a deserted area, which on subsequent investigation turned out to be near Leggett, California, 175 miles north-west of Watsonville. Some time later Sid was able to find the very spot where he was let out. After they landed on the hillside, Xeno told him to step out so that he could come back to the place later - to know this was real and not dreamed. He stepped out alone and walked around the outside of the ship. It was a large camping site for trailers which was not being used. He touched the ship and it was very smooth, like plastic. He felt the hull. It seemed very hard but not metallic. He had never felt anything like it before. The closest thing he ever felt on Earth would be a windshield - plexiglass. Looking under the craft he could see its leg-like landing gear. Xeno didn't tell Sid that touching the craft would do him harm, and he had no bad effects from it - none whatever. He tried to find markings on the ship but he didn't find a mark any place. Xeno showed Sid a picture and said "this is where we live." The photo showed buildings in the background, in the shape of a crescent. Windows could be seen but he said he had never seen such a strange photograph. The layout of the buildings had nothing in common with our own. They were quite far from each other. It looked like they put one about 50 feet from another and the next one 150 feet. There appeared to be roads in the distance and there was foliage in the foreground - trees and bushes too. Sid was also shown a photo of a city on the visitor's planet. Every building in that picture was rounded off, half moon shaped. Xeno described his Utopian society to Padrick. "As you know it, we have no sickness, we have no crimes, we have no police force. We have no schools - our young are taught at an early age to do a job, which they do very well. Because of our long life expectancy we have a very strict birth control. We have no money. We live as one." Sid was taken into a room that Xeno called the "Consultation Room." He told Sid that before they do anything they consult with Deity and get His direction. The color of the room defied description. Xeno asked him if he would like to pay his respects to the Supreme Deity? When he said that Sid almost fainted. He didn't even know how to accept it. He said to Xeno, "We have one, but we call it God. Are we talking about the same thing?" He replied, "There is only one" So I knelt and the only prayer he could think of to utter was his childhood prayer. He had tears running down his face because he was so touched by the feeling in the room. Until that night he had never felt the presence of the Supreme Being - but he did feel Him that night. It was obvious that they are on a very high scientific level, but their relationship with the Supreme Being means a lot more to them than their technical and scientific ability and knowledge. Sid would say that their religion and their science are all in one. After Sid said his prayer he was so emotional that he sat in a chair and recovered. He said the chair was covered in a silver blue metallic material and was so beautiful, something he had never seen before. After two hours Sid was taken back to where he had been picked up. He stepped out of the craft and walked home. His life would never be the same again. After that he had many more contacts by Xeno and his crew. They gave him scientific knowledge to where he started inventing things. He was our friend and a very nice person. I will always remember the time we spent with him and that I got to see their craft. In the next article I will tell you what happened when Sid reported this encounter to the Air force. Remember this interview took place in 1965. Since then the Air Force says it does not investigate UFO sightings. Do you believe that? There have been instances where a military person has investigated incidences up to the present day! Excerpted from "Beyond Top Secret" by Timothy Good. Sid Padrick reported his experience to the Air Force, and was grilled for three hours by a team headed by Major Damon B. Reeder from Hamilton Air Force Base (Headquarters, Western Air Defense Force, near Sacremento). ...they tried to frighten me. They said, "Mr Padrick, you are a real lucky person.... these craft that come down here are real hostile, and you had no business even approaching them. I disagreed with them, because when this craft came down, they did not want to frighten me... they did not tell me to go aboard their craft, they invited me aboard. The Air Force investigators allegedly told Padrick that there had been two instances where hostility had been involved: one the Mantell case, and the other an incident when an aircraft completely vanished from a radar screen (in fact there have been ore such incidents, as we have learned). Padrick claimed the Air Force informed him that there was more than one group of UFOs visiting Earth, and that there were friendly as well as hostile craft, from more than one source. The official Air Force report, signed by Major Reeder (base operations officer, Hamilton AFB) and forwarded to the Foreign Technology Division at Wright-Patterson AFB, includes further details of Padrick's conversation with the spaceman, from which I cite the following. Q: How did you evade our radar? A: The hull of our space craft absorbs energy and will not allow a reflection or harmful penetration. A: Yes, we are human, but not your type. Q: How did you pick me for this experience? A: We did not pick you. It was your choice. You are the first person ever to come aboard this ship. We have invited many before but they were frightened away. Q: If I were a scientist could I have learned more? Major Reeder reported that Padrick 'appears to be of above average intelligence with an excellent vocabulary and command of the English language. He is a glib talker... It is my opinion that this is not a valid UFO contact but rather an attempt on Mr. Padrick's part to get the Air Force involved in order to lend his story some authenticity and credibility. I disagree. Although I never met Sid Padrick (he disappeared from the scene in the late 1960s, having become tired of being harassed), I have listened to every inflection of his voice in the recorded interview on which this account is based, and he comes across as truthful. Under a barrage of cross-questioning by civilian investigators at the time, his answers were always clear, precise and without guile, and he was always quick to appreciate the humorous aspects of the incredible situation in which he found himself. THANK YOU TIMOTHY! And remember, I saw the craft myself. Interesting that we now have the "stealth" bombers that radar cannot detect! Hmmm wonder where they got that from??? I still have the drawings of the ship that Sid drew for my daughters. Also a tape of his lecture here in Seattle. According to Sid Padrick, who at the time of his alleged encounter on January 30, 1965, was 45 years old, he was walking along Manresa Beach near Watsonville, California, reportedly because he was suffering from insomnia at the time. It was nearly 2 a.m., and he was a short distance (approx. 1500 feet) from his house where his wife and three sons were sleeping soundly, when he claimed that something very unusual happened. His attention was attracted upwards by a noise similar to a jet aircraft at low altitude, but instead of a conventional aircraft, Padrick would later describe seeing a disc-shaped craft, "like two real thick saucers inverted," some 50 feet in diameter and 30 feet from the ground. As he watched in wonderment, the object slowly came closer, eventually hovering a mere foot or two above the beach sand. Padrick recalled later how he began to run toward home, when he heard a voice from the direction of the object. The voice, Padrick stated, told him not to be afraid and that they were not hostile. Initially, those words reportedly did not slow down his retreat, but then the voice repeated again that they were "not hostile," and also invited him aboard. Padrick claimed that at this point his curiosity overcame his fear, at least somewhat, and he then began to cautiously walk toward the craft. A door appeared and Padrick walked inside, and soon was conversing with a very human appearing gentleman wearing some sort of flying suit. The being spoke perfect American English, Padrick noted, and told Padrick that he could call him "Xeno", and that he could ask any questions he desired. Padrick stated, "It took 15 minutes for me to ask the first question. I was so darned scared." Padrick did ask what the purpose of their visit to earth was, and "Xeno" reportedly stated "observation only." "Xeno" provided Padrick with a tour of the ship, which consisted of 14 rooms and during the tour Padrick discovered that there were eight other crew members (one of whom was a woman). All of the beings were about 5' 9" to 5' 10" tall, estimated at 150 to 155 pounds, appeared to be 20 to 25 years of age, and all of them wore two-piece suits of a light bluish white color, which just happened to be the same color as the walls. In fact, each room was illuminated by a blue-white light. "The light seemed to come through the walls," Padrick stated, adding that none of the rooms had any square corners. They were rounded. It seemed that only Xeno spoke English. During the tour, the other crew members paid little attention to Padrick. They seemed to stay busy at their duty stations, working complicated looking instrument panels. Though they appeared quite human, Padrick did notice that their faces came to a point more than ours, with sharp chins and noses. Also their fingers appeared to be longer than ours. All of them had very light skin complexion. The men had short, wavy, and dark auburn colored hair, while the woman crew member had long hair (same color) that was tucked back under her clothing. While he was aboard the craft, Padrick believes he was taken for a ride. In fact, at one point he got out for about three minutes, and he noticed that they were on a hillside, which he later felt was a location near Leggett, California, some 175 miles northwest of Watsonville. In fact, he later felt that he had found the exact spot. At about 4:05 a.m. Padrick was returned and released back where his encounter had begun near Watsonville. A few days later, on February 4th, he phoned Hamilton Air Force Base and told them that he had witnessed the landing of a spacecraft, adding that he would only be willing to tell them more in person. Four days later a Major Damon B. Reeder paid Padrick a visit. Padrick showed the major where the encounter had occurred, and told him the whole incredible story. Major Reeder felt that Padrick, the owner of a TV-radio repair business, a private pilot, and a former member of the Air Force Reserve, was above average in intelligence, and noted that he had an excellent vocabulary, but was put off when Padrick mentioned that he intended to write a book or an article about his experience. Major Reeder was suspicious and felt that Padrick was making the whole thing up and intended to use the Air Force to make his story appear more credible. A newspaper story described how the mayor of Monterey, less than 30 miles distance from Watsonville, had seen a "bright object" over Monterey Bay on the evening of January 29th. APRO's Jim and Coral Lorenzen felt that Padrick was sincere, but that his experience had been a psychological delusion of some kind. John Keel, however, felt Padrick had been another victim of the so-called earth-based "ultraterrestrials." He pointed out how the aliens, like angels and elementals of yesteryear, all like to present names that are variations on ancient languages. He pointed out that Xeno (pronounced zee-no) in Greek means stranger. Ufologist Leneesa Garroutte still remembers when she first met Padrick back in 1965, when he came to Seattle and gave a lecture for the National Investigations Commission on Aerial Phenomena, which was headed by Robert Gribble. While in Seattle, he stayed with Leneesa and drew some sketches of the craft for her two daughters. (See drawing accompanying this article) Also Leneesa was with Padrick after his lecture and they were riding along in his friend's Cadillac and Padrick stated that he felt the UFO beings were above them. They pulled over and got out, and saw a "ship" overhead. I questioned Leneesa about this, and in a recent email she replied, "When it was over our heads it was a round white form." 1. The UFO Encyclopedia; The Phenomenon from the Beginning, by Jerome Clark. Vol. 2: L- Z, 2nd Edition. 1998. Omnigraphics, Inc., Penobscot Building, Detroit, MI 48226. ISBN: 0- 7808-0097-4. 3. Operation Trojan Horse, by John A. Keel. IllumiNet Press. 1996. ISBN: 0-9626534-6-2. Sketch of the ship by Sid Padrick. "Isaac Koi" indicates that on January 29, 1965, Sid Padrick claimed to have been welcomed into a flying saucer near Watsonville, California. The case was listed as Project Blue Book Case Number 9256 on the redacted US National Archives and Records Administration ("NARA") microfilm records of Project Blue Book, released to the National Archives in 1975 – see National Archives Microfilm Publication T1206 roll number 1. 1975, Clark, Jerome and Coleman, Loren "The Unidentified" (1975) at pages 228-230 (in the unnumbered section entitled "Paraufology: Understanding the Incomprehensible", part 1), 233-234 (in the unnumbered section entitled "Paraufology: Understanding the Incomprehensible", part 2), of the Warner paperback edition. 1998, Clark, Jerome in his "The UFO Encyclopedia: The Phenomenon from the Beginning - 2nd edition" (1998) in Volume 2:L-Z at pages 692-694 (in an entry entitled "Padrick Contact Claim") of the Omnigraphics hardback edition. 2000, Dolan, Richard in his "UFOs and the National Security State: Volume 1" (2000) at page 371 (in Chapter 7) of the Keyhole softcover edition, at pages 280-281 of the 2002 revised Hampton Road softcover edition. 1967, Green, Gabriel with Smith, Warren in their "Let's face the facts about Flying Saucers" (1967) at pages 44-46 (in the unnumbered chapter entitled "Weird Ride in a Flying Saucer") of the Popular Library paperback edition. 1970, Keel, John A in his "UFOs: Operation Trojan Horse" (1970) at page 228 (in Chapter 12) of the Souvenir Press hardback edition (with the same page numbering in the Abacus softcover edition). 1971, Keel, John in his "Our Haunted Planet" (1971) at pages 185-187 (in Chapter 14) of the Fawcett paperback edition. 1973, Keyhoe, Donald E in his "Aliens from Space" (1973) at page 198 (in Chapter 13) of the Signet paperback edition, page 225 of the Panther paperback edition. 1997, Pope, Nick in his "The Uninvited" (1997) at pages 29-31 (in Chapter 2) of the Simon and Schuster hardback edition, with the same page numbering in the Pocket Books paperback edition. Albert Rosales indicates in his catalogue that in Manresa Beach, California, on January 30, 1965, at 02:00 a.m., Sid Padrick, 52, was walking along the beach at night when he heard a sound and saw a large dark object approaching over the ocean. He ran from it but heard a voice form it say, "Do not be frightened, we are not hostile." It descended to within 2 ft of the beach, and the voice invited Padrick to come on board, which he did. 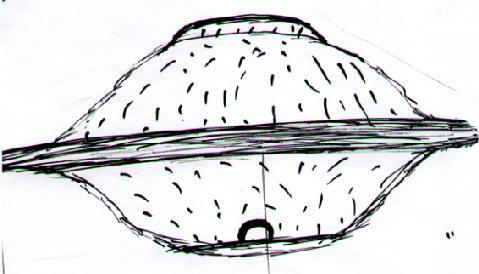 The UFO, which bore no lights, was shaped like a 50 ft sphere with top and bottom cut off, and surrounded by a horizontal flange. Entering through a brilliantly lit antechamber, Padrick was met and taken on a tour by a young man dressed in close fitting, bluish white 2 piece suit, continuous with the footgear. This man, who identified himself as "Zeeno," said that they came from a planet invisible to us, as it is always behind one of the planets we can see. Their society had no sickness, vice or crime. Padrick saw on a TV screen another such vessel, identified as their "navigating craft." He was taken for a ride to some spot in the mountains and brought back to the beach after duration of two hours. Albert Rosales indicates as source "Major Damon B. Reeder, Air Force Sam Vestal and Paul Cerny." The website indicates that on January 30, 1965, at 01:55, in Manresa Beach, California, USA, walking on beach, a dark disc approached from the ocean. A voice said "we are not hostile." Invited aboard, the witness met a young man dressed in tight, bluish-white two piece suit. He was taken for ride to mountains and back, for two hours. It was a close encounter with a craft and its occupants. There was one dark disc observed by one male 52-year-old witness on the shore for two hours (Clemens; Padrick, S). A noise was heard. Nine 5.8-foot-tall humanoids, each wearing a blue suit, were seen. The website comments that the "Vallee reliability rating" is "043", "Unknown or unreliable source; site visit by a skilled analyst; natural explanation requires major alteration of several parameters. " The sources are indicated as Webb, David, HUMCAT: Catalogue of Humanoid Reports; Project Bluebook, (USAF) Blue Book files counted in official statistics; Data-Net Report; Keel, John A. UFOs: Operation Trojan Horse, G. P. Putnam's Sons, New York, 1970; Pereira, Jader U., Les Extra-Terrestres, Phenomenes Spatiaux, Paris, 1974; Schoenherr, Luis, Computerized Catalog (N = 3173); Flying Saucers, Flying Saucers Magazine, (Palmer); Bloecher, Ted R., Ted R Bloecher investigation files; CUFOS Proceedings 1976, Proceedings of the CUFOS Conference: 1976, CUFOS, Chicago, 1976; Hatch, Larry, *U* computer database, Author, Redwood City, 2002. NICAP's Donald Keyhoe said soon enough what to make of such tall-tales. [---] ? Major Damon B. Reeder, US Air Force. [bb1] ? January 1965 case listing by Project Blue Book of the US Air Force, compiled in October 1965, available at www.bluebookarchive.org/page.aspx?PageCode=MAXW-PBB2-546. [---] ? Interview of Sid Padrick in the magazine The Little Listening Post, USA, March-April 1965. [---] ? Sam Vestal, journalist at the Watsonville Register-Pajaronian newspaper, Watsonville, California, USA. [---] ? Paul Cerny (Ufologist and field investigator around 1965), USA. [jk1] * "Who Was That 6-Inch High, Animated Tin Can I saw You With Last Night? ", article by John Keel, in The True Report On Flying Saucers, True magazine special issue, USA, 1967. [---] ? "Let's Face the Facts About Flying Saucers", book by Gabriel Green and Warren Smith, Popular Library publishers, USA, pp 44-46, 1967. [---] ? "Why UFOs? ", book by John Keel, Manor publishers, USA, page 212, 1970. [---] ? Article in the saucerist bulletin Flying Saucers Magazine, Ray Palmer editor, USA. [---] ? "UFOs: Operation Trojan Horse", book by John Keel, reprint of "Why UFOs? ", Putnam's Sons publishers, 1970. [---] ? "UFOs: Operation Trojan Horse", book by John Keel, reprint of "Why UFOs? ", Souvenir Press publishers, USA, page 228, 1970. [---] ? "UFOs: Operation Trojan Horse", book by John Keel, reprint of "Why UFOs? ", Abacus publishers, USA, page 228, 1970. [---] ? "Our Haunted Planet", book by John Keel, Fawcett publishers, USA, pp 185-187, 1971. [dk1] ? "Aliens from Space", book by Donald E. Keyhoe, Signet Books publishers, USA, page 198, 1973. [dk1] ? "Aliens from Space", book by Donald E. Keyhoe, Panther publishers, USA, page 225, 1973. [dk1] ? "Les Etrangers de l'Espace", book by Donald E. Keyhoe, French version of "Aliens from Space", France-Empire publishers, France, pp 264-265, 1975. [cc1] ? "The Unidentified", book by Jerome Clark and Loren Coleman, USA, pp 228-230, 1975. [cc1] ? "The Unidentified", book by Jerome Clark and Loren Coleman, Warner publishers, USA, pp 233-234, 1975. [---] ? "HUMCAT: Catalogue of Humanoid Reports", case 1965-10, compiled by David F. Webb and Ted Bloecher, CUFOS, USA, 1978. [---] ? "Proceedings of the CUFOS Conference", Center for UFO Studies (CUFOS), USA, 1976. [---] ? "Encounters With UFO Occupants", book by Coral and Jim Lorenzen, USA, 1976. [yn1] * "Les O.V.N.I. Et Les Extraterrestres Dans l'Histoire - Volume 3", book by Yves Naud, pp 67-78, Famot publisher, Switzerland, 1977. [---] ? "Computerized Catalog", compiled by Luis Schoenherr. [mm1] * Article in the skeptical ufology bulletin Magonia, U-K., #46, June 1993. [ia1] * "ET's From??? ", electronic text by Ira Adams, USA, via the Internet, 1993. [tg1] ? "Beyond Top Secret", book by Timothy Good, Pan Books publishers, U-K., 1997. [---] ? ""The Uninvited", book by Nick Pope, Simon and Schuster publishers, U-K., pp 29-31, 1997. [---] ? ""The Uninvited", book by Nick Pope, Pocket Books publishers, U-K., pp 29-31, 1997. [---] ? APRG, on the Internet, May 1997. [---] ? "The UFO Encyclopedia Volume 2 - The Phenomenon from the Beginning", book by Jerome Clark, 2nd Edition, Omnigraphics Inc. publishers, USA, 1998. [pc1] * "Alien Intervention - The Spiritual Mission of UFOs", book by Paul Christopher, Huntington House publishers, page 81, 1998. [bh1] * "UFOs and Alien Contacts - Two Centuries of Mystery", book by Robert E. Bartholomew and George S. Howard, Prometheus Books publisher, New York, USA, page 322, 1998. [---] ? "*U* Computer Database", compiled by Larry Hatch, USA, 2002. [---] ? "UFOs and the National Security State: Volume 1", book by Richard Dolan, 2000, Keyhole publishers, USA, page 371, 2000. [---] ? "UFOs and the National Security State: Volume 1", book by Richard Dolan, 2000, Hampton Road publishers, pp 280-281 USA, 2000. [ik1] ? "A Chronology of Frequently Discussed UFO and SETI Related Events (From 1877-2006) - Preliminary draft of 'Koi Chrono Core'", electronic document compiled by Isaac Koi, U-K., 2006. 0.1 Patrick Gross August 19, 2008 Creation, [bb1], [jk1], [dk1], [cc1], [yn1], [mm1], [ia1], [tg1], [pc1], [bh1], [go1], [ue1], [br1], [ik1], [ar1], [ud1]. 1.0 Patrick Gross August 19, 2008 First published. This page was last updated on August 19, 2008.